Decorative zippers for your sewing projects. They can be sewn on the outside and decorated with fancy stitches. They are available in several colors. Zipper handles with fun shapes for children's clothing and accessories. Novelty zipper with the edge finished in a lace shape, in black color. The pull is in bronze color. These zippers are conceived to be stitched on the outside, using the decorative holes of the fabric.Content: The shown price is per unit.Material: Synthetic fabric and metal.Length: 22cm. Novelty zipper with the edge finished in a lace shape, in light blue. The pull is in bronze color. These zippers are conceived to be stitched on the outside, using the decorative holes of the fabric.Content: The shown price is per unit.Material: Synthetic fabric and metal.Length: 22cm. Novelty zipper with the edge finished in a lace shape, in white color. The pull is in bronze color. These zippers are conceived to be stitched on the outside, using the decorative holes of the fabric. Content: The shown price is per unit. Material: Synthetic fabric and metal. Length: 22cm. Novelty zipper with the edge finished in a lace shape, in ivory color (yellow pastel). The pull is in bronze color. These zippers are conceived to be stitched on the outside, using the decorative holes of the fabric. Content: The shown price is per unit. Material: Synthetic fabric and metal. Length: 22cm. Novelty zipper with the edge finished in a lace shape, in green color. The pull is in bronze color. These zippers are conceived to be stitched on the outside, using the decorative holes of the fabric.Content: The shown price is per unit.Material: Synthetic fabric and metal.Length: 22cm. Novelty zipper with the edge finished in a lace shape, in purple color (eggplant). The pull is in bronze color. These zippers are conceived to be stitched on the outside, using the decorative holes of the fabric.Content: The shown price is per unit.Material: Synthetic fabric and metal.Length: 22cm. Novelty zipper with the edge finished in a lace shape, in beige color (light brown). The pull is in bronze color. These zippers are conceived to be stitched on the outside, using the decorative holes of the fabric.Content: The shown price is per unit.Material: Synthetic fabric and metal.Length: 22cm. Novelty zipper with the edge finished in a lace shape, in brown color. The pull is in bronze color. These zippers are conceived to be stitched on the outside, using the decorative holes of the fabric.Content: The shown price is per unit.Material: Synthetic fabric and metal.Length: 22cm. Novelty zipper with the edge finished in a lace shape, in dark blue. The pull is in bronze color. These zippers are conceived to be stitched on the outside, using the decorative holes of the fabric.Content: The shown price is per unit.Material: Synthetic fabric and metal.Length: 22cm. Product Description: Embellishment for zipper with the shape of a little hen. Content: Price is per unit. Material: Plastic (with metal loop).Diameter (without chain): 22mm. 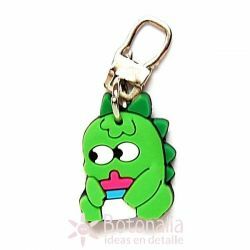 Product Description: Zipper pull embellishment with the shape of a little dinosaur.Content: Price is per unit.Material: Plastic (with a metal hanger).Embellishment's diameter (without the chain): 22mm. Product Description: Zipper pull embellishment with the shape of a fun bird. Content: Price is per unit. Material: Plastic (with a metal hanger).Embellishment's diameter (without the chain): 30mm.